First I must apologize for the tardiness in my latest post. I’ve been doing too many things lately and with the seasonal cold that swept our household before Christmas, and Christmas itself, not to mention the kick-off to a very exciting New Year… well my food blog just took a back-burner these past three weeks. But here are a ton of posts of my favourite things just for you. Happy New Year, may 2013 be truly amazing for you and yours! This morning’s brunch was a lesson in many things. Today after finding this recipe on Pinterest, and craving these easy-to-make waffles for a year, I finally got to make them. 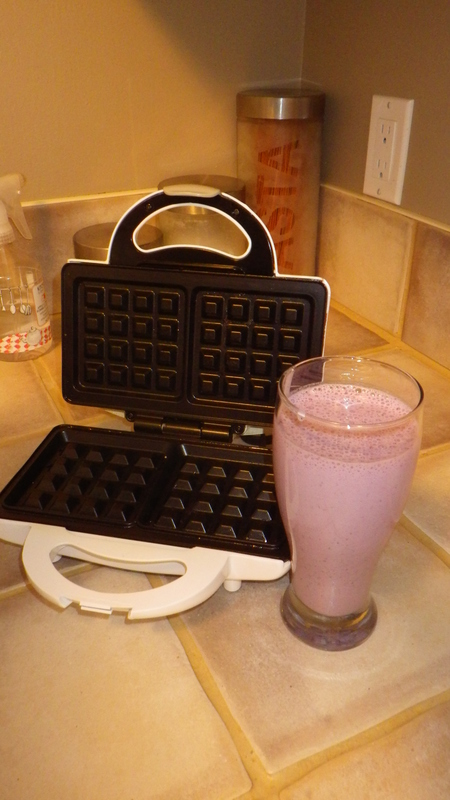 First step, borrow a waffle maker from a friend. Second step, locate Pillsbury product in your local grocery market – Superstore made them a bit hard to find. Third step, educate husband on how to use a waffle iron (i.e. spray with Pam, after each use). You can follow this recipe if you want to try this for yourself as I’m not going to bother typing the recipe up after my experience. I ate a half a waffle and then threw them out. It was like eating a combination of cardboard and shoe leather as there was no doughy texture left in the middle of the waffle. I kind of expected that as I’m not a fan of the Pillsbury Cinnamon Buns anyways. I used Grands Pillsbury Cinnamon Buns, so maybe the ‘buns’ were too thick for the smaller machine that I borrowed. 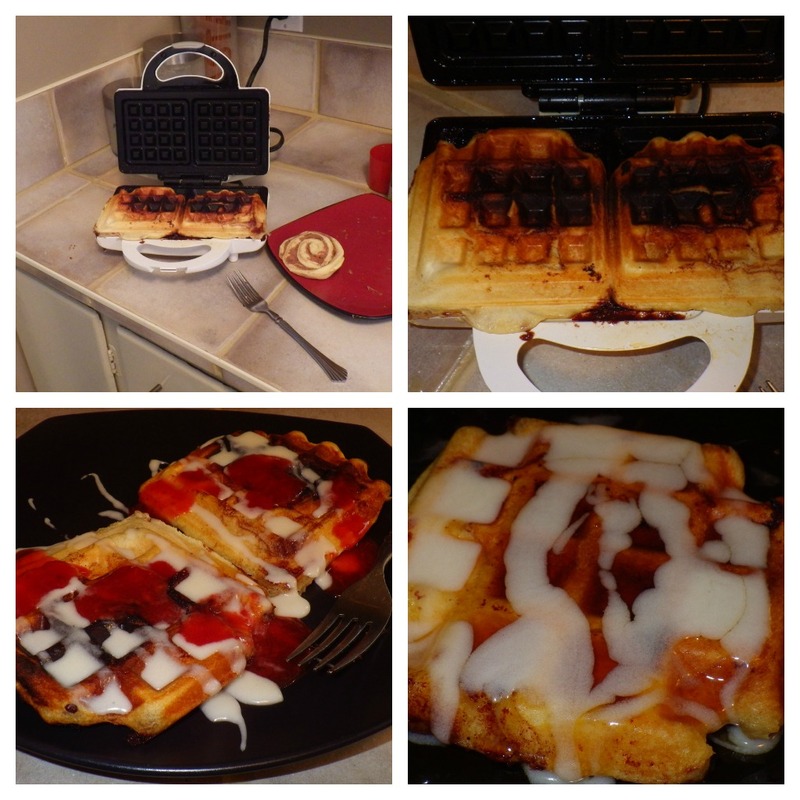 If you want to try this, I’d suggest you use a bigger waffle iron in combination with the smaller pack of cinnamon buns. This will more than likely help you to achieve that beautiful round shape as shown on this Simply Designing blog. Also, we obviously have been neglecting our beautiful house-smoked bacon from our local German butcher as it was definitely off this morning and met its maker in the round-bin. Lesson learned – refreeze that great bacon in single-use packs. Better yet… stock up on the very low-fat/high-protein Freybe Back Bacon at Costco, which is where I’m off to today! I took all this as a sign from the ‘weight-loss gods’, and it’s back to my usual 2013 breakfast of a blueberry (or strawberry) smoothie. Here’s how I make mine, and I love it thanks to a good friend who taught me a secret about picking the right protein powder. Making a smoothie is super easy, fast, economical, and healthy! Now if I could just get my husband to drink them everyday – men! Pour ¾ cup skim milk into your blender. Add ¼ cup any fruit diced, and preferably defrosted frozen fruit does not break down as nicely as I would like in my blender (Is there a way to sharpen a blender’s blades?). I defrost a small baggie of frozen berries (enough for 2 smoothies) in my fridge overnight. Add a squeeze of Agave Nectar, about ½ to 1 teaspoon. Agave Nectar has a lower Glycemic Index than honey – Thank you Ellen DeGeneres for teaching me that! Blend on high (Liquefy if you have a KitchenAid blender like mine) for 1-2 minutes. NOTE: The longer you blend your smoothie the more air gets into it, and adding more air amplifies mixture (think whipped cream). The the larger your smoothie gets – the fuller you will feel, longer. I can usually go from 7am to after 1pm on just this one smoothie. Pour and enjoy because it tastes just like a milkshake! 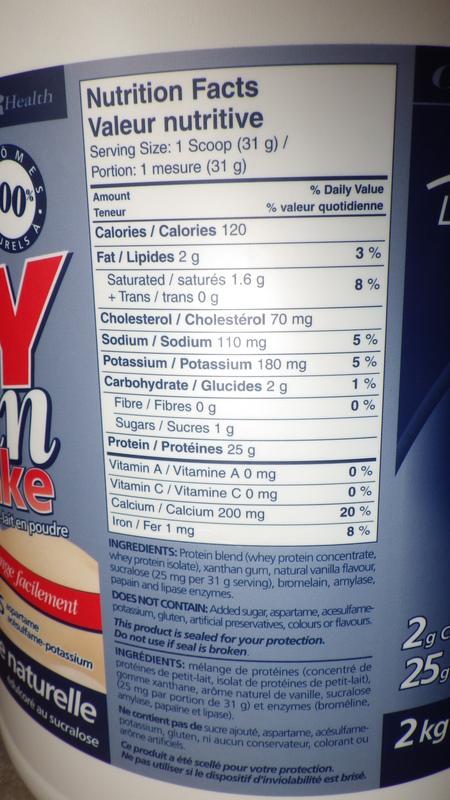 * This brand of protein powder does not contain fibre, and I realized that THIS is the protein powder that I love. 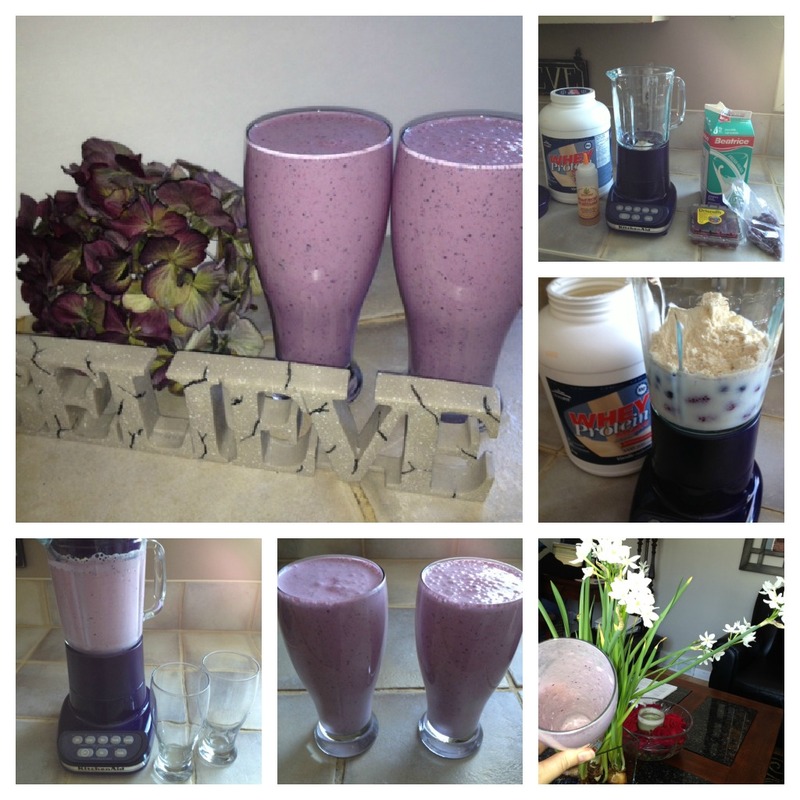 It creates a nice, smooth smoothie without that undesirable chalkiness or grittiness. This brand is also low-carb, and contains 25g of protein. Having more protein at breakfast helps you feel fuller all day long. And it’s VERY hard to eat 25g of meat at 7am – at least it is for me. TIMESAVING TIP: Make yourself a batch 5x this size, and pour into freezable drink containers so that you can grab-and-go in the mornings to work. I believe that my good friend just used Red Solo Cups as she’s a busy, working mom of two. Please feel free to share it below in the Comments section.